According the MailOnline, official travel documents, complete with identifies of many who have been slaughtered in Syria and Iraq, can be purchased from forgers for as little as $2,000.00. In fact, a MailOnline reporter, Nick Fagge, having learned of the scam, checked it out, and in less than 4 days acquired himself a Syrian passport, Turkish driver’s license, and official identification cards in the name of a dead man. 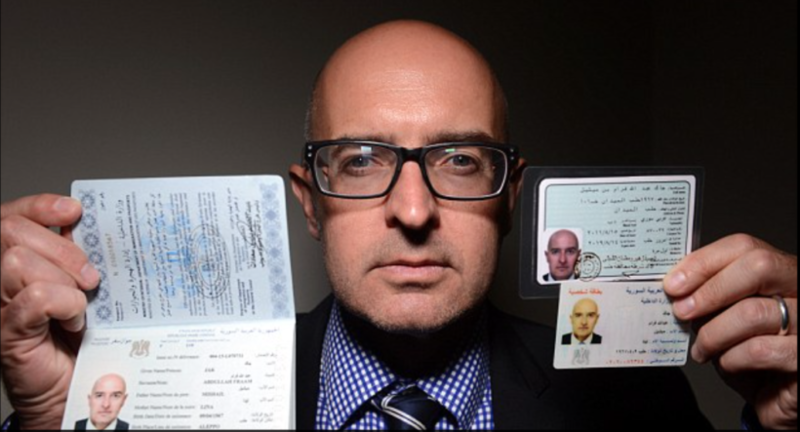 Photo above is reporter Nick Fagge holding forged papers he bought in Syria, September 2015. The group of 37 Republicans want to attach their proposal to a funding bill that lawmakers are still hashing out that would extend 2016 spending levels for a few more months. They want to put language in the bill that would “prevent federal funds from being using to admit to the United States refugees from Syria, the Middle East and North Africa” until certain conditions are met, they wrote in a letter to Speaker Paul Ryan, House Majority Leader Kevin McCarthy and Appropriations Chairman Hal Rogers. The letter was sent late last week, before the attacks that occurred in New York, New Jersey and Minnesota over the weekend. This moratorium, they said, would only be lifted once key federal agencies implement procedures that ensure refugee and related programs “are not able to be co-opted by would-be terrorists.” They also requested that the procedures be provided to Congress in classified and public formats and that the government implement a “longer-term monitoring process” for refugees admitted to the U.S. They would, however, allow for U.S. funding to cover the safety of refugees overseas, including their food, housing and medical aid. The group of lawmakers point to the “continuing threat of terrorism” following attacks “by radical Islamic jihadists” in Paris, San Bernardino, Brussels, Nice, Germany, Istanbul and Orlando as the reason for moratorium. They criticized the Obama administration for admitting 10,000 Syrian refugees into the U.S. over the last year. Lawmakers are still hammering out the details of the spending measure, but they only have two weeks left to avoid a government shutdown on Oct. 1. President Obama met last week with congressional leaders in the House and Senate to discuss spending negotiations. Democrats and the president would almost certainly oppose the freeze on the refugee program. 2. a) What is the total number of members of the U.S. House of Representatives? b) How many are Democrats? How many are Republicans? c) What is currently the party divide in the Senate? d) How many members of Congress signed the letter to the GOP leaders? 3. a) What specifically do they want to include in the spending bill? b) When did the group send the letter to House leaders? b) What conditions do the Congress members suggest should be met for the moratorium to be lifted? 5. a) What reason does the group give for requesting the moratorium? b) Do you think these Congress members are making a reasonable request? Explain your answer. 6. What funding are they not opposing in regard to these refugees? 7. Democrats and the president would almost certainly oppose the freeze on the refugee program. If the majority of Republicans agrees with the 37 who wrote the letter, should they stand firm in their belief, or give in to the Democratic minority since President Obama would veto it anyway? Explain your answer.